Overcoming policeman Jim Kimball who had legitimately entered the grounds surrounding a mansion, a murderer dresses as the officer and breaks into the home of Harper, a scientist whom he kills and disposes of the body. 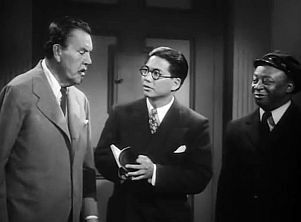 Charlie Chan, who continues his wartime work for the government as a secret service agent, is called to the case by Inspector Godfrey. He tells Chan that the scientist has been working for the government to develop a process whereby wood could be made as strong as metal. At Harper's mansion, Chan and Godfrey question, with the help of the local authority, Sheriff Mack, all those who live at the scientist's residence: Louse Harper, his sister and housekeeper, Jean Kent, his orphaned niece and housemaid, Roth, his butler, Michael Strong, his mute chauffeur and handyman, and Walter Meeker and Stella Graham, his assistants. Chan quickly learns that the entire household hated Harper, whose cruelty allowed him to force his relatives to work for him as servants. Meanwhile, Charlie Chan's two assistants, number four son Eddie (Edward) and Birmingham Brown, his chauffeur, arrive at the Harper estate after having been forced to leave the hotel in which they had been staying as Chan had inadvertently checked the whole party out. Later, Chan discovers Harper's body, which he reveals to all in dramatic fashion, noting each person's reaction. Meeker tells him that all of Harper's work will come to nothing unless the scientist's secret formula can be found. Chan states that when the murderer is found, the formula will be found as well. The local coroner, Samuel R. Peabody, declares that Harper died of natural causes. Chan disputes his finding, and when he visits the coroner's office, accompanied by Sheriff Mack, Peabody discovers a small poisonous dart at the back of the dead scientist's throat. Chan later discovers that Jim Kimball, the missing local policeman, was having a secret romance with Jean Kent. Although both Stella Graham and Meeker state that they saw a policeman enter the house at about the time of Harper's disappearance, Jean contends otherwise. Roth promises to reveal the identity of the murderer to Chan, but before he can do so he too is killed. After examining the dead butler's quarters, Chan tells Mack that Roth was killed in his room, despite the fact that both Edward and Birmingham had seen the butler walking down stairs moments before he had collapsed dead. Lloyd Archer, Harper's stepson, arrives at the estate, claiming that Harpers secret gas formula was stolen from his father. Later, as he is searching for clues, Chan is nearly killed by a small poison dart. The next morning, Chan finds that someone has become trapped inside of Harper's booby-trapped secret vault. The vault can only be opened by the voice of the deceased scientist speaking a secret word code. Realizing that someone inside is being gassed and will soon die, Chan uses a recorded message containing the secret code that had been made earlier on a dictaphone by Harper to unlock the vault. Jean Kent is found unconscious inside the vault. Later, after recovering, she states that she had not been attempting to steal the secret formula, but had heard someone inside and had gone in to investigate. Michael Strong, having let Edward and Birmingham know that he was able to reveal identity of the murderer, is killed in front of Chan and several others. Soon afterward, Kimball's body is then discovered by Birmingham and Edward inside of a cabinet in Harpers gas chamber laboratory. Chan announces that all of the murder victims were killed by an air gun hidden inside a ventriloquist's dummy. He also reveals, with the help of Edward, that the dead Roth had walked with the aid of strong puppeteer's strings. Knowing that Stella is both a master puppeteer and very strong, Chan names her as the killer's accomplice. He then states that a life mask, one of many that had been made for identity purposes by Harper, that was broken during Strong's murder, was that of Meeker. The laboratory assistant tries to escape, but is overcome by several persons. Chan then pulls a rubber mask from his face to reveal that he is really Archer. Meeker's body is found later, hidden in the basement. Telling her that Archer had planned for her to die in Harper's secret vault, Stella is convinced to tell all, and she states that Archer, a vaudevillian quick-change artist and impersonator, is actually her husband. With the case successfully solved, Chan thanks his son for his assistance, though he states that he is unsure of what the assistance was. NOTES: The working title of this film was Mystery Mansion. The title card on the print reads: Charlie Chan in "The Jade Mask." Early Hollywood Reporter production charts include Russell Simpson in the cast, but it is unlikely that he appeared in the released film. The Variety review mistakenly identifies Edwin Luke's role as Tommy in the accompanying list of credits. Edwin Luke, who played Edward Chan in this picture, was the younger brother of actor Keye Luke, who had previously played son Lee Chan in numerous films in this series. No barber shave so close but another barber find some work to do. Things misplaced sometimes furnish very good clues. Murder know no law of "relativity." That is new look on old business. At last, pieces of murder puzzle begin to fit in place. Fog of murder will soon lift and household be happy again. As Pop says, that proves: "Dead men can walk, only when they have lots of help." Another in the Charlie Chan series, "Jade Mask" is above par and should do well on the duals. They pulled out all the stops in this one. Sidney Toler, as usual, is the Chinese detective who solves the killings and clears the mystery in his usually quiet fashion. Touches of comedy are added by Martan [sic] Moreland, as a colored chauffeur, and Edwin Luke, as the detective's son. THE LOCATION OF HARPER'S HOUSE: "On Cove Road." THE DISTANCE FROM HARPER'S HOUSE TO THE CITY (NEW YORK? ): "Three miles." THE NATURE OF HARPER'S PROJECT: A "gas process that hardens wood to the toughness and durability of metal." HARPER'S SPOKEN COMBINATION TO OPEN THE DOOR OF HIS SECRET ROOM: "Thirty days hath September, July, and August." LLOYD ARCHER'S DEROGATORY TERM FOR SHERIFF MACK: "Farmer"
Dictaphone - A trademark used for a machine that records and reproduces dictation for transcription. life masks - Casts made of the faces of living persons. Charlie Chan: "Note many life masks of household about place." spirit oil (or mineral spirits) - A volatile distillation product of petroleum, used as a thinner for paints and varnishes. Edward Chan: "Now we're cooking with spirit oil." zombie - A corpse that has been reanimated through a supernatural spell or power. Sheriff Mack: "...I can't see how it was done unless Roth was a zombie."